Easy Fondant Icing on Hungarian Esterhazy Torte. © 2009 Barbara Rolek licensed to About.com, Inc. This easy fondant icing is not intended to be rolled. The recipe is for a fondant that is poured over cakes, tortes, petit fours and cookies while still warm. That means no kneading, ripening or remelting. The appearance of poured fondant is a high-sheen covering that hardens to a tender outer shell like a glaze but with a ​creamy interior. Rolled fondant, on the other hand, is a slightly chewy, rubbery affair that many people prefer not to eat. This recipe will make enough to cover the top and sides of a 4- to 6-layer (8-inch) torte. Place confectioners' sugar, water, and corn syrup in a small saucepan and stir until well mixed. Set over low heat and stir until dissolved. Don't let the temperature exceed 100 degrees on a candy thermometer. If glaze doesn't look opaque enough, add more confectioners' sugar. Pour warm fondant over item to be glazed (which has been set on a cooling rack over a sheet pan), tiling the item until all sides have been coated. Scrape any fondant that has dripped onto the sheet pan. Rewarm, strain and save to be used again. Not all fondants are equal. A fondant can be the creamy center of a chocolate candy. It is the liquid that spurts out of a chocolate-covered cherry when you bite into it. 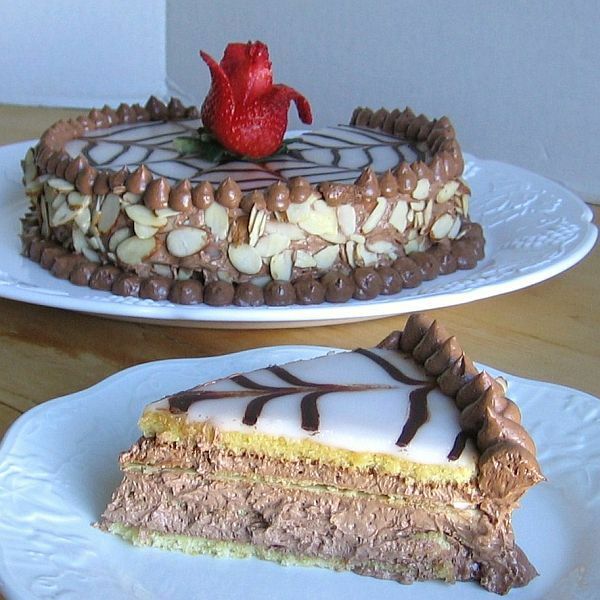 It is the shiny icing on top of petit fours, pastries like Napoléons and cakes like this Hungarian Esterhazy Torte recipe. And it is the rolled matte-finished covering on a wedding cake or other celebration cake. It all depends on how it is made, how it is treated after making it (kneading, ripening, remelting) and the application it is used for. Basic Fondant Recipe: This recipe can be used as the creamy interiors of chocolate candies, as a poured fondant when remelted and as rolled fondant used to cover cakes. Marshmallow Fondant Recipe: This fondant is made with mini marshmallows and can be used as you would regular fondant -- to cover cakes, form shapes, and make candy. Uncooked Fondant Recipe: That's right, this fondant requires no cooking. It's made in a mixing bowl and can be used for a variety of fondant candies and fillings. Chocolate Fondant Recipe: Here's another uncooked fondant that gets a boost from melted semisweet chocolate chips. Classic Rolled Fondant Recipe: This traditional rolled fondant recipe is made with confectioners' sugar, glycerin, and unflavored gelatin.